Remember when social media stocks were all the rage? It already seems like a long time ago when the market eagerly awaited any social media company going IPO. Typically the shares were snapped up right away and the stock would soar. Twitter (NYSE: TWTR) is probably the best example of this fad. The microblogging site went IPO in 2014 and the stock soared above $50 per share. It was still above $50 about a year later. But, by mid-2015, reality hit. Investors started to figure out that, besides Facebook (NASDAQ: FB), it was very difficult to generate ad revenue growth on social media platforms. As the numbers started coming out, TWTR stock got hammered, dropping below $15 in 2016. However, when a company has several hundred million users, you can’t just write them off entirely. 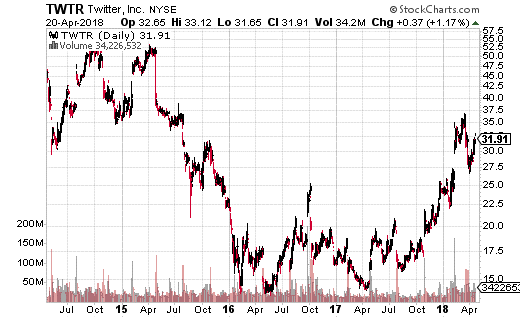 Lately, TWTR has gotten the attention of the investment crowd again, and is back above $30. Just last year, we probably had the biggest social media IPO since TWTR, in the form of SNAP (NYSE: SNAP). SNAP’s Snapchat was one of the most popular social media platforms out there, especially for the younger crowd. It also debuted to much fanfare and investor excitement. You can see where the stock immediately shot up after its IPO. But this time, it didn’t take long for the reality of the numbers to set in. Just like TWTR, the investment community wanted to know how SNAP would monetize its user base. When no obvious answer was forthcoming, the stock dropped. 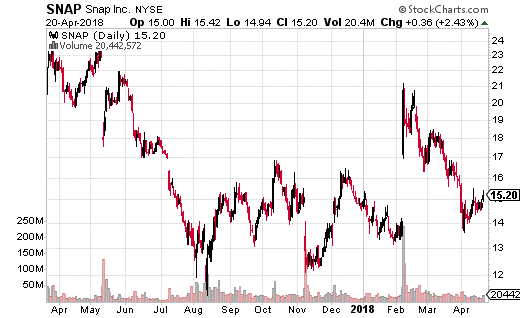 SNAP has mostly been in the $12 to $16 range for the last year, although it did briefly spike above $20. So is this one-time social media darling about to move again? At least one trader thinks the stock could make a big move… in either direction. This past week, a trader purchased the May 4th 15 calls and the 14.5 puts with stock trading at $14.88. Buying both calls and puts in the same expiration at the same time, but using different strikes is called a strangle. This particular strangle cost $2.20, which means breakeven points for the trade are $17.20 and $12.30. That’s a pretty big move in either direction for such a cheap stock. Plus, the trader bought 375 strangles which is over $80,000 in premiums. Why would he or she spend $80k for a two week trade with long odds? It’s all about SNAP’s earnings. The company releases earnings on May 1st, and the strangle buyer is obviously expecting the market to react strongly. I have no problems with this kind of trade, as long as you keep your quantity low. SNAP is definitely the sort of stock that could move $3 (20%) after earnings. But, you don’t want to use up a bunch of capital on a two-week trade that requires such a sizeable gap. Instead, this is the type of trade where you buy 1 to 3 lots and hope to double your money. You don’t base your trading strategy off of these kinds of trades. However, it’s not bad to take a flier every once in a while during earnings season if you have strong conviction a stock is going to move, but no opinion on the direction. Are you getting triple digit winners in your options trading? Want some?